Telenor Pakistan along with Nokia has come up with an attractive deal for Nokia X2-01 users. Now x2-01 users can connect to the internet free for a whole month with unlimited downloads exclusively on the Nokia X2-01 handset, and enjoy other services like Email, Chat and Social Networking. Handset (available at Telenor Sale & Service Centers) has come up with pre installed Telenor Internet app "NEWSuCHOOSE"
Purchase Nokia X2-01 Handset from any Telenor Sales and Service center or Nokia retailer, and insert your Telenor SIM. 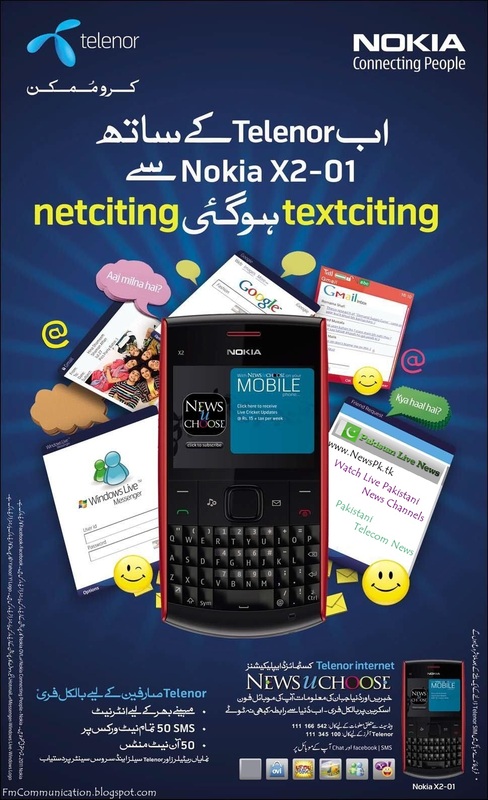 Free Minutes, SMS and internet will be awarded after One week of inserting Telenor SIM into Nokia X2-01.